Permaglide bearing elements from KS Gleitlager, especially when used in system applications in commercial vehicles, stand for cost effectiveness, dependability, and longevity. Now, KS Kolbenschmidt is presenting the new, zero-lead and hence eco-friendly plain bearing family KS P240, KS P241, KS P242 and KS P243, which delivers clear benefits in terms of friction and wear as well as zero maintenance, especially in situations involving oscillating rotation and high static/dynamic loads. There are many components and functions we take for granted in everyday life as long as everything works well. This also goes for plain bearing shells and bushings from KS Gleitlager GmbH. These serve a multitude of applications on commercial vehicles of all kinds, both inside and outside the engine – for example, connecting rod and main crankshaft bearings. Others can be found on the vehicle chassis, in mechanical linkages, compressors, or hydraulic components. One particularly complex use of plain bearings in this category is the lever of pneumatic commercial vehicle disc brakes. In terms of load, durability and robustness, the requirements to be met by these plain bearings have risen sharply in recent years, since the brakes are designed lighter and lighter and more and more compact, while the requirements on their performance are continuously increasing. The special conditions governing brake systems in commercial vehicles are reflected in the greased bearing positions (initial lubrication), the oscillating loads, which can be well above 200 MPa, and the installation position with its unequal load distribution, where local peak loads are the rule rather than the exception. All this leads to special requirements on the material design. The sliding surface must be highly adaptable and wear resistant. Friction must be kept in check to ensure that the release/return function of the brake shoes is not impeded. As a rule, the sliding surface is provided with lubricant pockets, which can take up enough grease to ensure this function throughout the service life of the brake system. In the development of the new family of plain bearings from KS Gleitlager, a friction- and wear-optimized high-duty polyamide is used as a basis for the polymer slide surface (Fig. 1). Depending on the brake requirements, the thickness of the surface layer and the size of the lubricant pockets can then be varied. Since in-house expertise on the subject of plain bearings is limited – if at all available – on the part of Tier 1 and 2 suppliers, KS Gleitlager offers its customers an all-in package extending from problem analysis through the engineering of a plain bearing concept for customer validation to a post-operational appraisal of the parts. Besides state-of-art analysis and measuring techniques, special design and simulation tools are used. Unknown error configurations are simulated on self-developed test benches. In this way, failure mechanisms are understood and suitable remedial action can be selected. Until now, scaled test benches outside concrete applications have only inadequately reproduced the load situations for the aforementioned brake levers. So, a special bench for testing the highly stressed brake lever bearings has been designed. With this test bench the conditions in a brake actuating system can be reproduced quite faithfully. It is also possible to install original brakes for even closer transferability of the results for special applications. 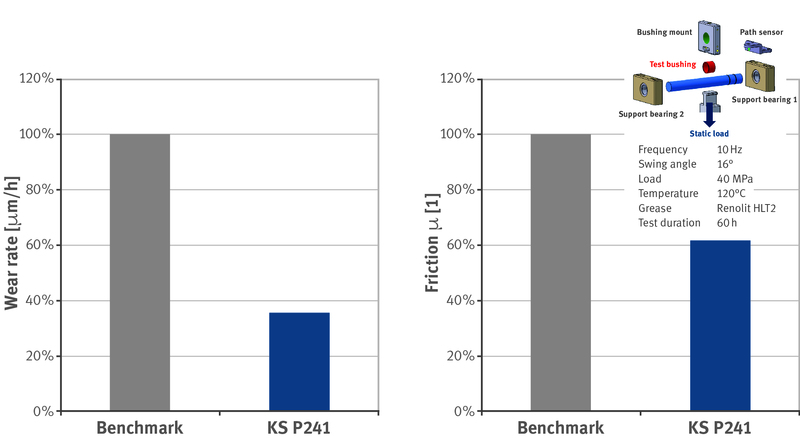 The new test bench has, on the one hand, accelerated the development work on the new plain bearing family KS P240 to KS P243 (Fig. 2) and, on the other, enabled an identification of the dominant wear mechanisms, thus allowing, for example, an optimized lubricant pocket design (grease depot) to be derived. The results already obtained from system validation confirm the outstanding friction and wear properties and illustrate the vast potential inherent in complex, grease-lubricated bearings built from the new materials. Other non-brake uses for commercial vehicles would include chassis bearings (steering knuckles) and bearings for mobile hydraulic systems. Robust bearings of this kind are also candidates for applications in off-road vehicles and related actuator systems.